Todd Van Hoosear is the VP, Public Relations & Stakeholder Engagement at the HB Agency (Hart-Boillot). Todd serves as a Vice President in HB’s PR group, focusing on enabling better stakeholder engagement for HB’s clients. Todd also teaches the New Media and Public Relations class at Boston University, which explores the effects of new media on the fundamental theories, models, and practices of public relations. 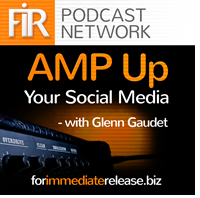 Todd recently joined AMP Up Your Social Media’s host Glenn Gaudet to discuss how PR has changed in the past two decades and how important it is to find key influencers. Specifically, what are you marketing/PR goals? Where are your customers and what are their interests? What will it take to rise above the noise and standout amongst your competitors? Based on the goals and objectives of your campaign and who your audience is, who are your top influencers? Todd believes in creating social organizations: in helping businesses use new and old media to create relationships that inform and empower their employees, customers, partners and supporters. His love of social media led to his role as the founder of the Social Media Club’s Boston chapter, his subsequent involvement in the boards of the Publicity Club of New England and the Find Your Missing Child foundation, as well as his position as an adjunct professor at Boston University. Todd loves walking, hiking, climbing, biking and, when he can get it in, swimming. While work and play have taken him overseas, his true passions lie in his own city, neighborhood and backyard. Todd holds Bachelor’s and Master’s degrees in Communication from Michigan State University.